It's going to be a sprint right until the finish line on May 15, as Real Madrid refuses to give up and keeps the pressure on Barça and Atletico. The Merengues have now defeated Real Sociedad in Anoeta, thanks to another vital goal from Gareth Bale. 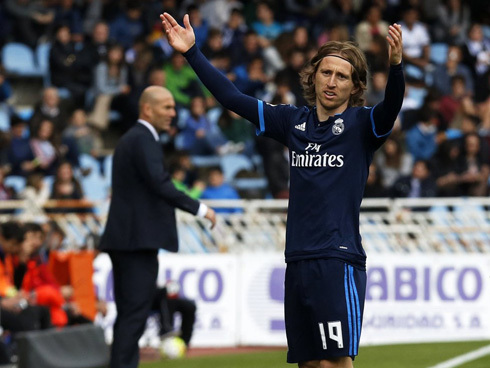 It's Real Madrid's 10th win in a row in La Liga, as the Merengues visited and beat Real Sociedad 0-1 in Basque territory to keep the chase alive on the top of La Liga standings. With Cristiano Ronaldo and Benzema unavailable for today's game, Zidane had to rely on Gareth Bale's heroics to see his team taking home the 3 points. The Welshman scored the winning goal and his 19th in the league season, when the game had just entered its last 10 minutes of the second half. It was Bale's 9th header goal in this league campaign and another proof that there are reasons to be hopeful in this Madrid even when Ronaldo is not on the pitch! Next Wednesday, Real Madrid hosts Manchester City at the Bernabéu for the Champions League semifinals second leg. Another tough away match and yet another game-winning goal from Gareth Bale, effectively keeping Real Madrid in the title race. With one eye on Wednesday's clash with Manchester City, there was always the potential for Madrid to falter at the Anoeta, a place that's been full of bad luck for Barcelona over the years. 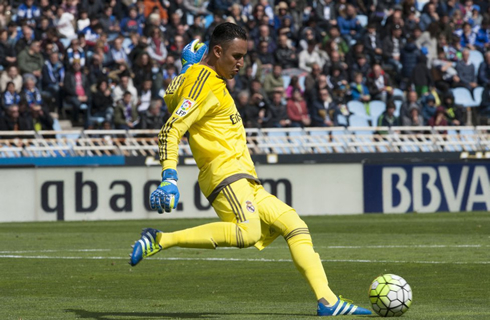 And for a while, it did look like Madrid could drop points, mainly due to the heroics of Rulli, La Real's exceptional Argentine goalkeeper. Zidane opted for a changed side today, giving rest to a few players ahead of the Champions League clash. With Ronaldo and Benzema nursing injuries, Castilla striker Borja Mayoral found himself in the starting lineup again, though the youngster failed to impress this time around. Real Madrid looked lethargic at times, but always maintained control of the game with James and Bale linking well in the first half. Bale, in particular, was the most active with a series of headers that he just failed to put on target. Eventually, he would get his best chance to score right inside the six-yard-box, but he would be foiled by Rulli. However and as Bale continued to push forward, the chances became more frequent and in the last 15 minutes Madrid really looked for the go-ahead strike. It would eventually come from the Welshman, who is having a fantastic season. His header went straight into the roof of the net from a Lucas Vazquez cross, allowing to reach his 9th header goal of the season and making him the highest goal scorer from the head in Europe's top leagues. Attackers: Lucas Vázquez, Gareth Bale, Borja Mayoral. Cristiano Ronaldo next game with Real Madrid for the UEFA Champions League is on May 4 of 2016, against Manchester City. You can watch Juventus live stream, Real Madrid vs Manchester City, Bayern Munich vs Atletico Madrid, Manchester United vs Leicester City, Swansea City vs Liverpool, and Southampton vs Manchester City, all matches provided from our soccer live game pages.